If your bathroom needs an update, your first instinct might be to remodel it. Your second might be to panic because remodeling can take a bite out of your budget. While your bathroom could benefit from a complete remodel in the near future, the following budget-friendly ideas for your bathroom can help transform it now. 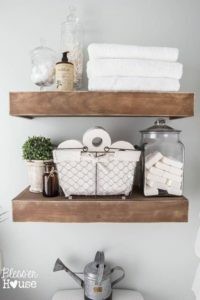 Declutter – Soaps, lotions, hair dryers, brushes, combs, toothbrushes, toothpaste, razors, and other necessities and knickknacks can quickly multiply, taking up valuable counter and bathtub deck space. Spend some time decluttering. Chances are, you’ll find multiple nearly empty bottles that can be tossed. Clearing your drawers and cabinets provides you with more space to stash items out of sight. 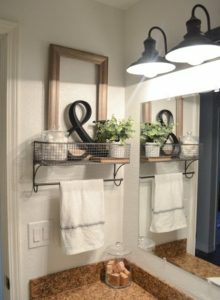 Accessories – Do you love your current bathroom accessories or are they dated or cheap looking? An old plastic wastebasket may have served its initial purpose, but if you don’t love it, consider updating it with a more stylish option. Consider adding designer baskets to control the clutter yet keep your necessities within easy reach. Update your lighting fixtures – Does your bathroom still have the utilitarian light fixtures that came with the house? While they do the job, a world of attractive and affordable lighting options is out there waiting for you. 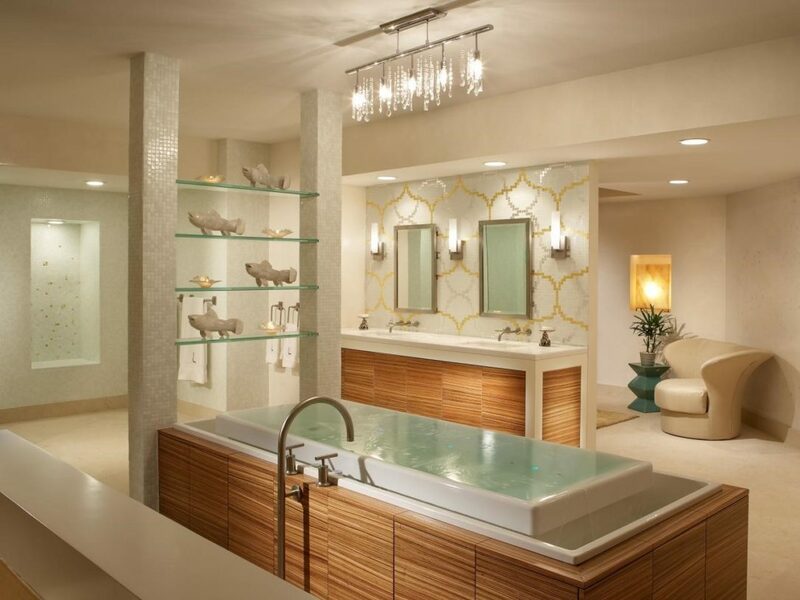 Imagine how a modern wall sconce, an industrial 3-light bar, or a playful bathroom light with mosaic glass could change the personality of your bathroom. Towels and towel racks – Still hanging your favorite bath towels over the shower door or rod? Freestanding towel racks are a lovely choice, and you don’t need to drill into the walls. If you prefer a wall-mounted towel rack, consider a swivel arm towel rack or a towel rack with a built-in shelf on top. While you’re at it, invest in a set of luxurious bath towels. Invest in pretty shelving – Just about everyone agrees that they need more storage space. Stylish shelves and cabinets look amazing and provide you with extra space for stashing washcloths, toiletries, towels, reading material, tissue, or even a houseplant. Quality bath and shower fixtures – Good quality fixtures are worth the cost. Not only are they beautiful and functional, you’ll enjoy your morning or evening bathing ritual that much more! 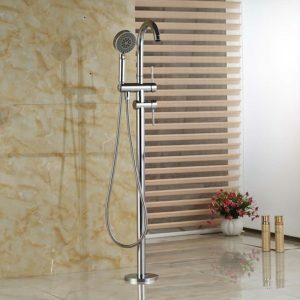 Imagine showering under a ceiling mounted rain shower head or soaking in a freestanding bathtub with a gorgeous handheld shower wand. 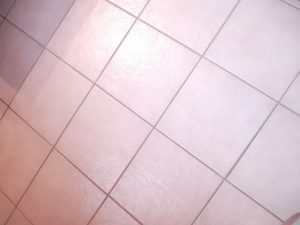 Paint your tile grout – Redoing your bathroom tile would be a major undertaking. However, if the main problem with your existing tile is its dirty, ugly grout, this can be a fairly quick and affordable fix. Grout paint is specially formulated to color and seal your existing grout. 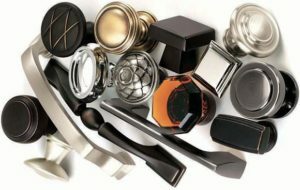 Drawer pulls and knobs – Have you browsed the drawer pulls section of your local hardware store lately? 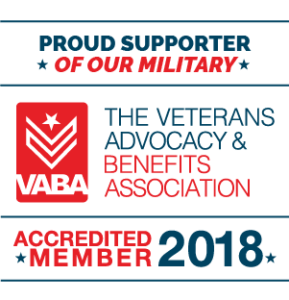 You may be surprised at the selection! Adding new drawer pulls to your drawers and cabinets can provide a nice contrast and can add personality to the room. Designer door – Who says bathroom doors need to be solid white, or wood for that matter? Consider a frosted glass door, sliding barn door, double doors, french doors… The possibilities are endless! A counter top sink – Counter top sinks are stunning, and available in a variety of styles. 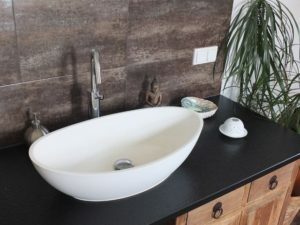 With the right tools and instructions, installing a Badeloft counter top sink can be a DIY project that transforms the look and function of the bathroom without a huge financial investment. These budget-friendly bathroom ideas are affordable and can be done individually or all at once. Pick the ideas that work best for you and fall in love with your bathroom once again.